In 1904, at the age of eighteen, Al Jolson and his brother Harry (along with Joe Palmer) were trying out an act in a New York burlesque house. The name of the act was "A Little Bit of Everything." It was in this act that he would have a go at being a comedian; however, it didn't work out very well at first. They were booked for a week at a theatre on Fulton Street in downtown Brooklyn, New York. 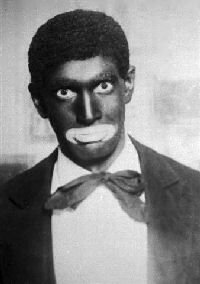 Another performer, named James Francis Dooley, who appeared in blackface, suggested to Al that he go on stage in blackface. The idea was that by doing the act in blackface, i.e. wearing burnt cork, it would give him some layer of protection from his fears as the blackface would allow him to 'hide' behind this colored mask. He tried blackface the very next performance; it worked out for him very well as he felt more confident and enjoyed being on stage all the more. 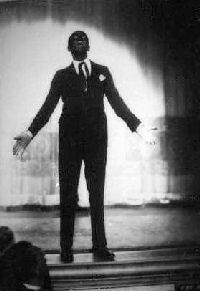 left: Jolson in the 1928 film "The Singing Fool"
In today's sensibilities, using blackface is politically incorrect and offensive to many. It is no longer used by entertainers today. 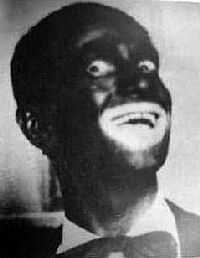 As time went on, though others may have used burnt cork, it was obvious that no one could do blackface like Jolson. On Broadway, especially at the Winter Garden Theatre, Jolson most often played a character named Gus, who often clowned around on stage using his unique comedic touches, and of course sang a few songs in each show he was in. Click on the earphone icon to hear the question and the answer by Jolson.